If you receive any income during the year that's not subject to withholding—your employer doesn't conveniently deduct what you're likely to owe the Internal Revenue Service from your pay—this doesn't spare you from paying taxes on that income. You'll just have to make estimated payments to the IRS on your own. You might also want to make estimated payments if some circumstance arises during the year that makes it unlikely that the amount withheld from your pay will be sufficient to cover your eventual tax debt. Of course, you can always wait and send payment when you file your tax return, but this isn't the ideal solution because you'll likely owe interest and penalties. The IRS wants you to pay as you go. If you worked for an employer, he would submit your taxes to the IRS on your behalf after deducting them from your pay, and he would do it according to certain deadlines. The IRS wants you to follow a similar schedule if you're self-employed or if it looks like those deductions from your pay won't be enough to cover your entire tax bill come April. It has set a series of dates by which you should submit your estimated payments over the course of the year. The first payment is typically due on April 15. This covers income you earned from January 1 through March 31. The second payment is due two months later on June 15. It covers the period of time from April 1 through May 31. The third payment comes due on September 15 and covers June 1 through August 31. Then you get a little bit of a break until January 15 of the next year. This payment is for the time period from September 1 through December 31. These are guidelines—the exact dates can shift slightly from year to year if they fall on a weekend or a holiday. And there's no rule that says you can't pay them early. Here are some tips to help you make the most of it if you must maintain this type of ongoing relationship with the IRS. If you used tax software to prepare your return last year, it's most likely capable of resurrecting that data to give you some idea of what you'll owe in the current year. Some software even has the ability to build in certain scenarios so your income or deductions can be adjusted up or down. Using such a planning utility can help make your calculations for estimated payments more accurate. If you miss or are unable to make the first or even the second estimated tax payments, you can catch up by paying a little extra with your third payment. This can help avoid any big tax surprises and cash crunches come April when the final bill comes due. The important thing is to catch up as much as you possibly can before you file your return to minimize any interest charges and penalties. Big financial events are a prime time to revisit your tax calculations with an eye to figuring out if you should pay any estimated tax on gains from the transaction. You can do this at any time during the tax year. Remember, the schedule set by the IRS is a series of deadlines. You can always make a payment before that date, and you can cover your entire liability in one payment if you want to. You don't have to divide up what you might owe into a series of four quarterly payments. 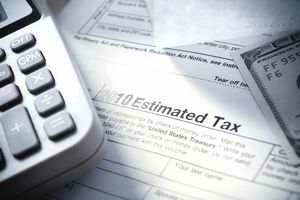 A penalty can be avoided if, among other things, you've "paid at least 90 percent of the tax for the current year, or 100 percent of the tax shown on the return for the prior year, whichever is smaller," according to the IRS. Tax Calculator by TaxSlayer: This nice-looking app can calculate federal income tax on wages, business profits, unemployment benefits, and Social Security benefits. It also handles common deductions for home and property, charity donations, education, and IRA contributions. Check it out via the Apple App Store, Google Play, or on their web app. TaxCaster by Intuit: This app also calculates federal tax. You can enter your income and other financial figures by sliding a button, or you can tap the little gray arrow (>) to reveal a place where you can type in actual numbers. Check it out via the Apple App Store, Google Play, or their website. TaxMode by Sawhney Systems: This is the most thorough of all the apps. It offers support for both simple and "full" data input, and you can get a free trial. Check it out via the Apple App Store, Google Play, or their web app. Total Tax Insights by the American Institute of CPAs: This web-only app calculates federal and state income taxes and it can even estimate property tax, cell phone taxes, and other state and local taxes. Plus, you can compare your tax calculations against two additional locations, which could be a handy tool if you're thinking of moving. Check out their web app 522. Mail a check along with Form 1040-ES. Here are the most current mailing addresses.